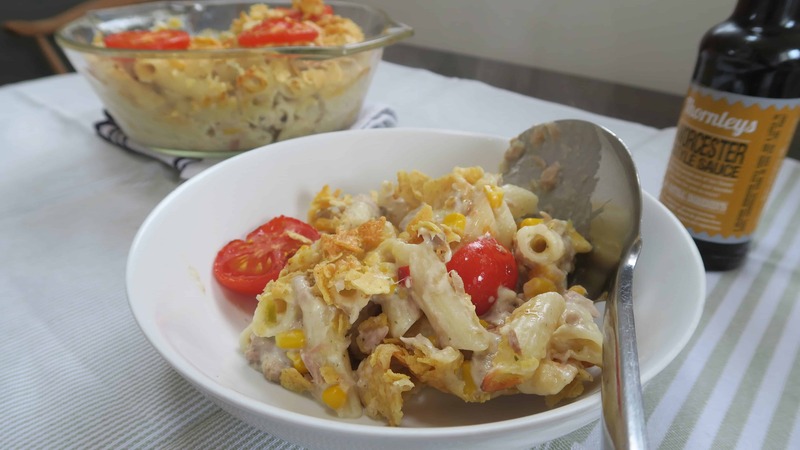 Gluten free tuna pasta bake always reminds me of my childhood – I remember my mum cooking it all the time and it was always topped with crisped-up, melted cheddar cheese, slices of fresh tomato and crunchy crisps. 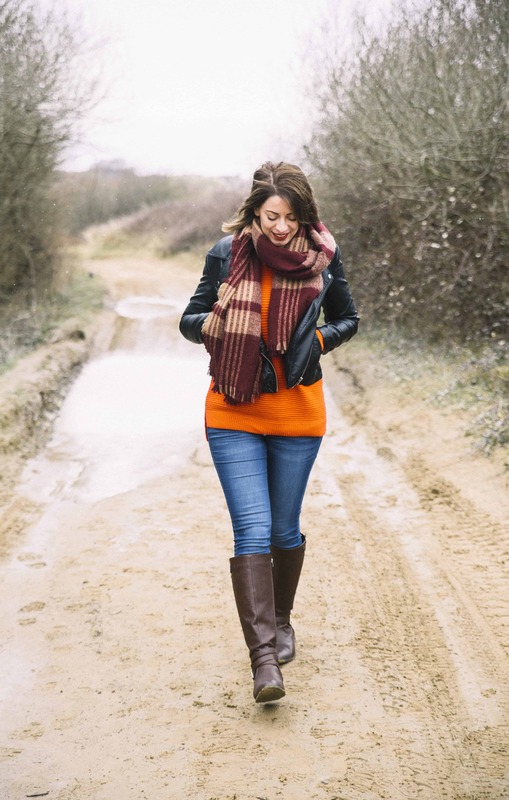 Nostalgic recipes are the best for dark and dreary days, so when Thornleys Natural Foods offered to send me some samples of their natural, gluten free sauce mixes and a tuna pasta bake sachet landed on my doorstep, I was quite literally saving it for a rainy day. And we have had plenty of those. But with drizzle dampening any hints of spring we felt from the sunshine yesterday, today was the day for comfort food. 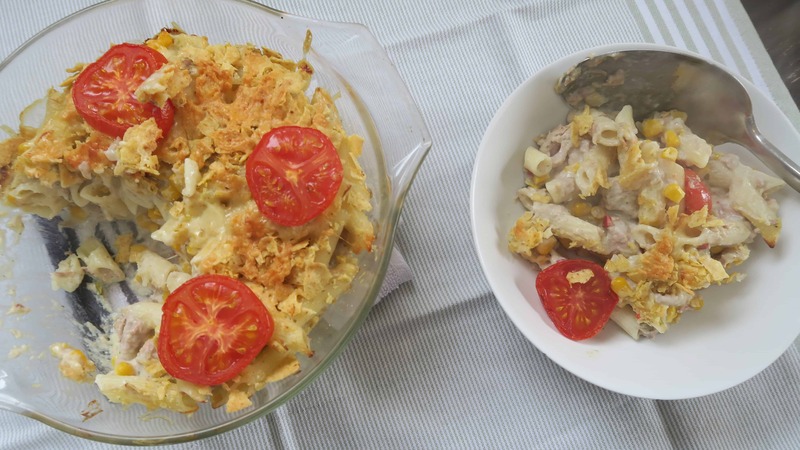 And gluten free tuna pasta bake was exactly what I was looking for. 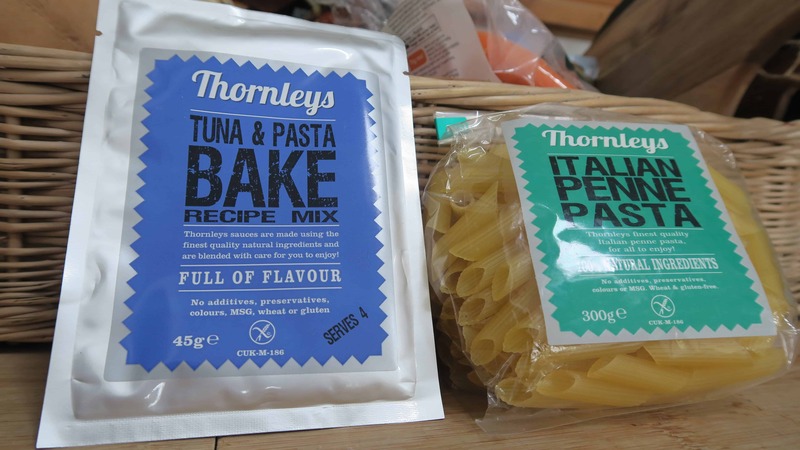 As well as a gluten free tuna pasta bake sauce mix (Thornleys do six different flavours of sauces, all gluten and wheat free, and made with natural ingredients) they also sent me some gluten free penne pasta, and some gluten free Worcester sauce too. 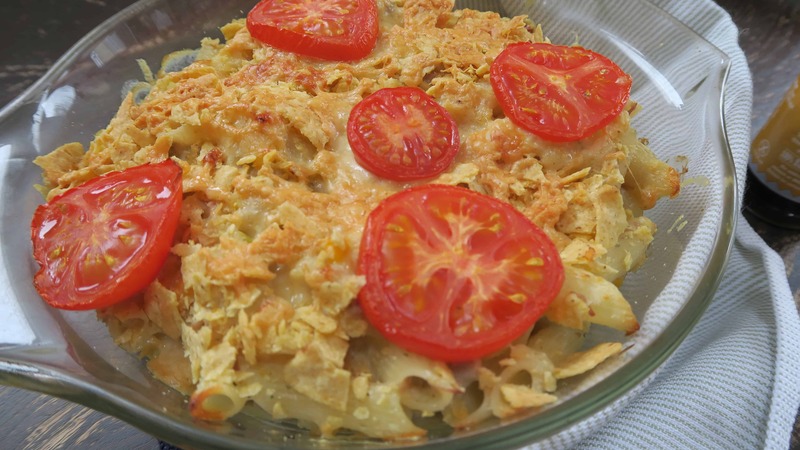 The gluten free tuna pasta bake was so easy to make. I cooked up the penne (8 minutes in boiling water) and it didn’t stick together at all – then drained it ready to add to the sauce. 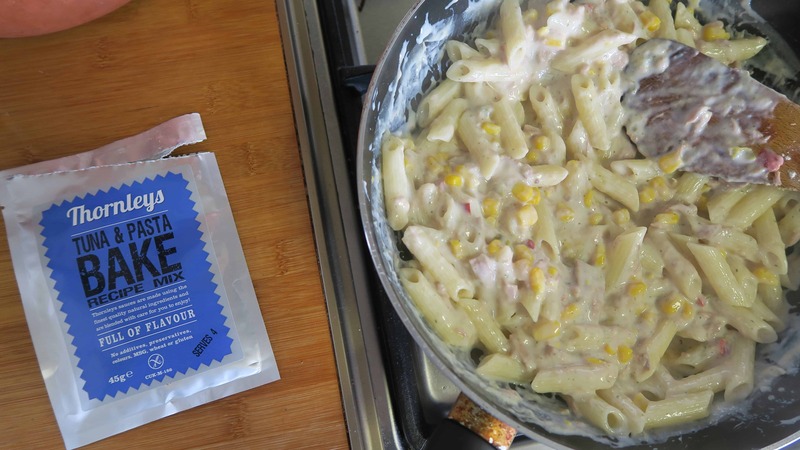 For the pasta sauce itself, you just add tuna, sweetcorn, and milk. It only took me about five minutes to whip up the pasta sauce ready to add the drained gluten free penne pasta. 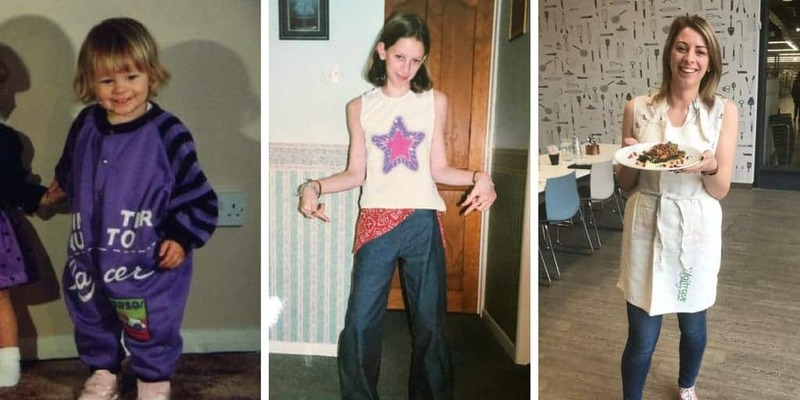 There was plenty of it – I used two tins of tuna in spring water (drained) and instead of plain sweetcorn, I used a tin of sweetcorn and peppers, because it was all I had in the cupboard and I didn’t want to go shopping! After mixing the gluten free pasta into the sauce, I decided to top mine with some grated mature cheddar, and some crushed crisps. I used some of the Well & Truly lightly salted tortilla chips, which added an amazing texture. 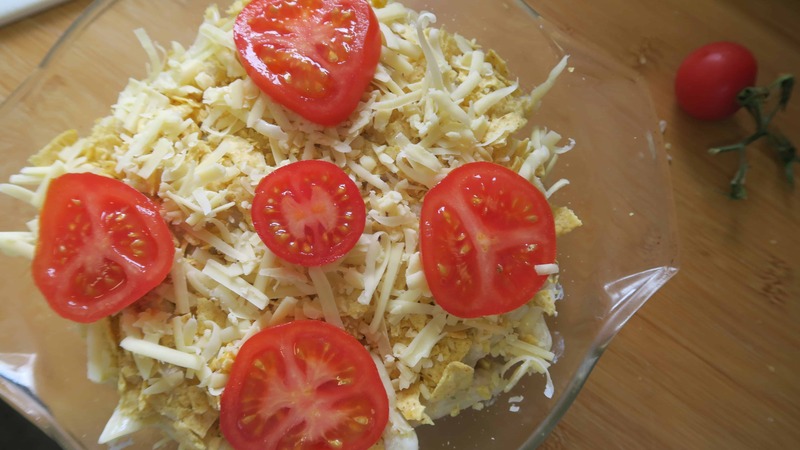 A few colourful slices of tomato finished it off ready to pop into the oven for 15 minutes. 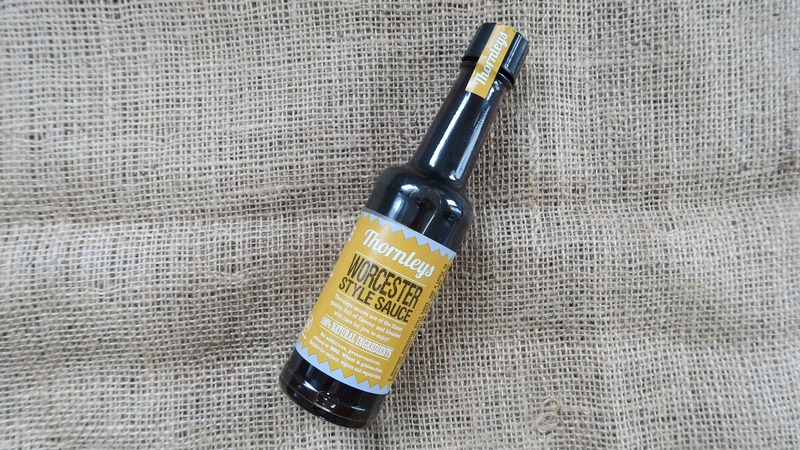 To finish it off, I decided to serve the portions with a little of the Thornleys gluten free Worcester sauce on top. In hindsight, I think I might have added this into the sauce to add a little tang. I love it in gluten free mac and cheese, so why not this!? 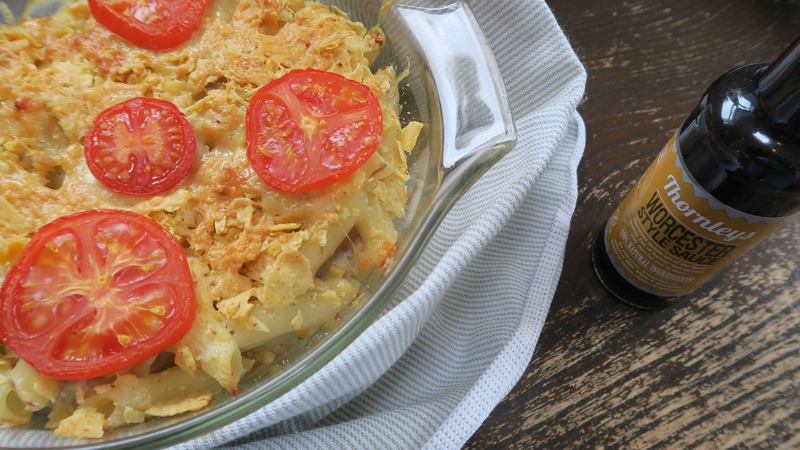 I was really impressed with this gluten free tuna pasta bake. It took me right back to my childhood and it was pretty simple if you want an easier option than making a gluten free white sauce. I used full fat milk in mine to make it extra creamy! I’d definitely be interested in trying some of Thornleys’ other mixes, especially the carbonara and the creamy chicken and herb sauce. They are really easy to make and at £2.30 a sachet, this made enough for four people and I think you could easily stretch it a little further as it was quite saucy. You can find out more about Thornelys Natural Foods and their gluten free range of pastas and sauces here. 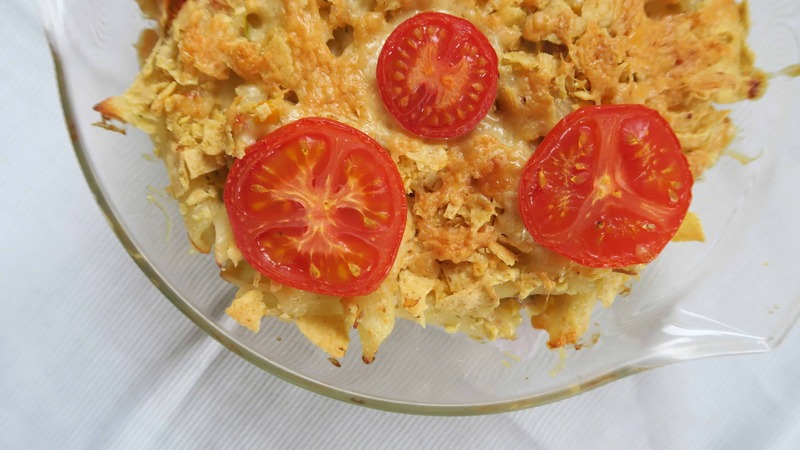 What is your favourite type of gluten free pasta bake? Is there a meal which brings you right back to your childhood too? Comment below with your thoughts or share them on my Facebook, Twitter or Instagram pages. *Thank you to Thornleys for sending me these samples free of charge to review. I often receive samples from brands but this in no way influences my opinion. Nothing could keep that quiet!